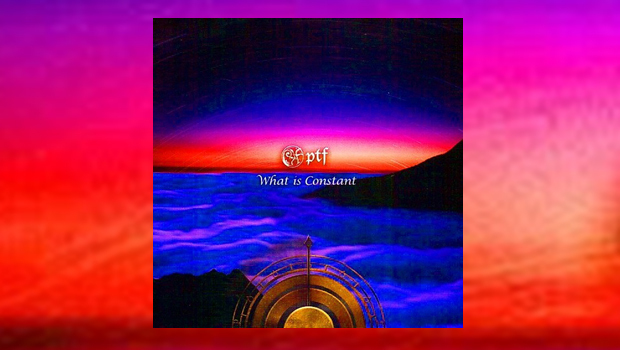 What is Constant is the second full album outing for Japanese Prog 4-piece instrumental outfit PTF who feature keys, drums, bass and violin. The album opens with an odd melange of styles in Time Lapse, the title perhaps suggesting that it is intended as a medley of ideas schizophrenically leaping from genre to genre, from lilting piano to Fripp-esque staccato riffs to elegiac themes through anthemic motifs to driving rock, frenetically changing every 32 bars or so. Using the first track to showcase the full musical catalogue seems a strange decision as none of the styles are explored satisfactorily and renders this a skip-over track for me. Things settle down into something much more tangible the four part suite The Thing (that is constant). Thankfully ideas are more controlled here and the album pulls itself together. Part one, Glacier Blue is a simple melody outlined with piano and violin but soon switching to full band with Hammond organ, piano, bass and drums, the fiddle floating elegantly with the theme using the chords and key changes to good effect. The rock beat converts into a waltz introducing a distinctly Yes flavoured repetitive riff, the bass line strongly echoing Chris Squire. We’re now well into the album and for the first time in the suite the Hammond organ takes a lead part before leaping back to the original romantic theme. Part Two, The Versatile begins as a brooding, menacing piece with rhythms built from the lower end of the frequency palette, but halfway through the mood changes with the fiddle lead tripping lightly over more easily tempered clavichord keys. Part Three, The Ridge kicks off with a solo violin reflecting an aggressive Paganini-esque (is that a thing?) riff with a hard rock rhythm for the duration of what is essentially a showcase solo for violinist Keisuke Takashima. Part Four, Cloud 9 is the longest piece revelling in luxurious Hammond chords. PTF have their roots firmly planted in ’70s prog and that is where this track sits before breaking out into a lively rock hoedown that would happily entertain an energetic Jed Clampett before merging uncomfortably into an altogether slower paced melodic elegy. In reality this ends the track but it restarts as before, reprising the suite and bringing the themes together before ending with a strangely anti-climactic fade. Grappelli style fiddle kicks off the final track, unassumingly titled The Boundless Scenery of the Spheres, which has a lighter mood than the previous suite being a more immediately accessible ballad led by both the violin and keys. Although being Japanese, PTF have established themselves in the European prog tradition with obvious influences from Tarkus era ELP and Hiroyuki Ito’s bass lines sometimes running almost parallel with Chris Squire. The recording features very little overdubbing and emulates a live performance with little trickery or evidence of 21st century instrumentation. Even the violin rarely uses distortion pedals. There are some production issues here and there, a solo violin lead dropping obviously back in the mix when joined by rest of the band for example, but overall the sound is well balanced revealing each player’s contribution. Overall, this is a dense symphonic album which might have benefited from having a little more aural space. As a showcase of clearly superb musicianship it is a resounding success, but at times to the detriment of the actual pieces in question. What Is Constant is an ambitious CD in today’s marketplace and can be welcomed as a rare foray into the ‘albums-that-should-be-listened-to’ genre – there is nothing suitable here for background music at your dinner party. Repeated visits would benefit the listener as there is much to take in and fans of early instrumental ELP, Soft Machine and Yes will find much to enjoy.